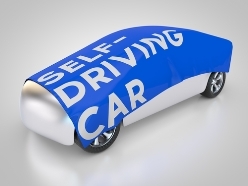 President Obama's recently unveiled budget for the next fiscal year contained an intriguing proposal for the future of road travel in the United States: a nearly $4 billion investment to encourage the development and adoption of safe self-driving vehicles. The money would be spent on real-world pilot projects over the next 10 years. Work with the National Highway Traffic Safety Administration (NHTSA) and the auto industry to develop common safety and performance standards, as well as analysis methods, for self-driving vehicles. Collaborate with state leaders to develop legislative policies for automated vehicles that can inform a consistent federal policy. Consider rule interpretation requests from auto manufacturers. Work with the NHTSA to ensure that self-driving cars can be deployed in large numbers if they're found to be safer than currently available vehicles that use human drivers. Current research suggests that self-driving vehicles have the potential to greatly reduce the number of serious accidents that occur each year. Secretary Foxx estimates that driverless technology could have prevented as many as 25,000 accident-related deaths in 2015 alone. Self-driving cars may make roads safer 10 years from now, when they become commonplace. However, all the self-driving cars in the future can't erase the damage caused by negligent human drivers today. If you were injured in an accident caused by another driver's negligent or careless behavior on the road, you may be able to seek compensation for past and future medical bills related to the crash, damage to your vehicle, lost wages or loss of earning potential, and even pain and suffering. Contact the skilled legal team with Steinberg Injury Lawyers today for a free evaluation of your case or catch up with us on social media. You can find us on Facebook, Twitter, YouTube, and Google+.